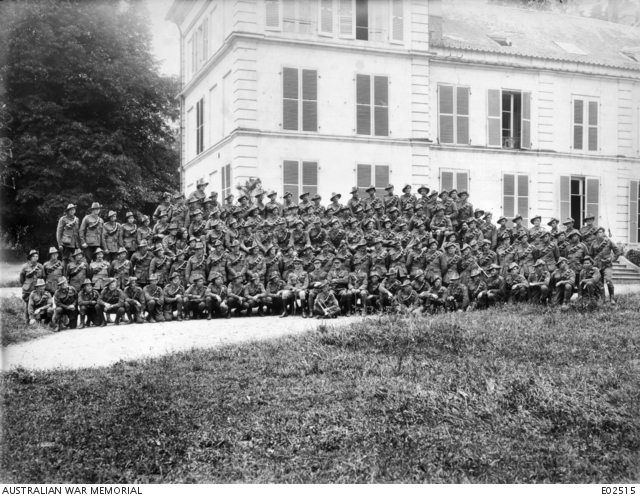 Group portrait of the 37th Battery of the Australian Field Artillery outside the Chateau, Cocquerel, France on 14 June 1918. 2225 Gnr Thomas Edward McKenna of Grafton, NSW, wounded 11 August 1918 (29). 155 Dvr William Keith Devine of Bismark, Tasmania, 1914, furlough to Australia (61). 23313 Gnr William Joseph McCulloch of North Melbourne, Victoria (93). 3356 Saddler William Stephen Johnson, Manning River, NSW (110). 1098 Dvr Ernest Hannan of Hurstville, NSW (134). See E02515K for position of those named in this caption. Where is Gnr George Grant Stephen, when was this photo taken, he did not return he was a Casualty in France on the 13/August/1918. surely this is worthy of mention he was at WW1 from May 1915 till the date of his death.